Race day dawned clear, cool and breezy — nearly perfect conditions for the start of the 2009 Mt. 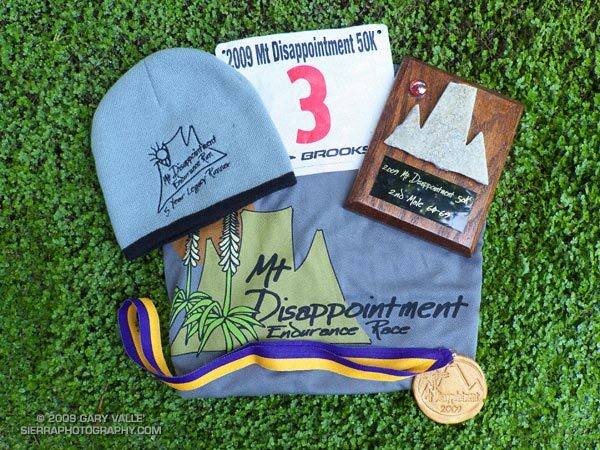 Disappointment 50K and 50 mile Endurance Runs. This was the 5th edition of the 50K, a classic race that starts and ends on the summit of Mt. Wilson, and features a demanding mix of technical single track trail, dirt fire roads, and the Mt. Wilson Rd. 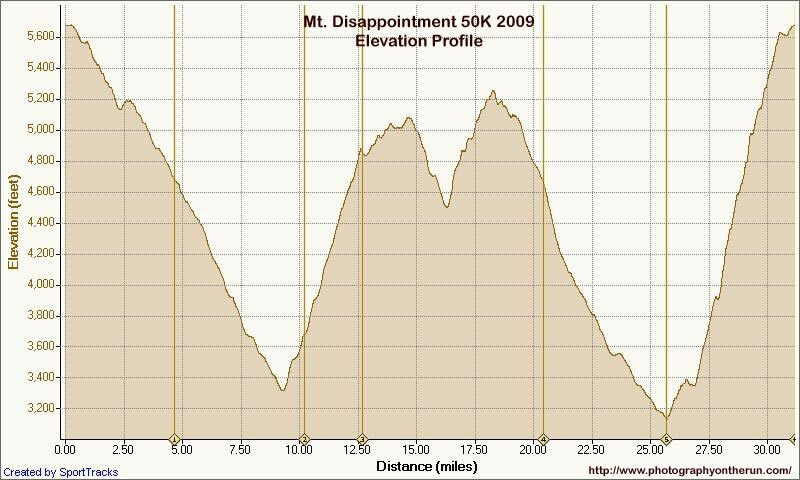 With over 5000′ of legit gain and loss, and a climb to the finish of 2600′, it is a course that many underestimate. If the 50K is difficult, the 50 mile is difficult squared. 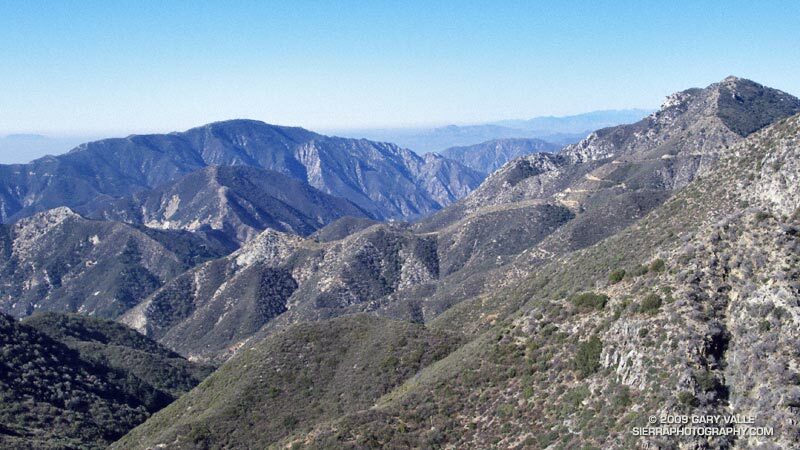 In addition to the final arduous climb to the finish, the 50 mile run features a brutally exposed 6 mile ascent to Shortcut saddle that most do during the hottest part of the day. My goals for this year’s 50K were to a) complete it, b) have fun!, and c) try to get my time back down under 7 hours. I’d been working some on improving my running technique. Would it make any difference? Following are some notes from this year’s race. This year I’ve used the GPS distance as calculated by SportTracks, rather than the official aid station distances. These distances are approximate. The times between aid stations should be relatively accurate, but may differ from the official times. As a result of the Mt. Lowe Fire Road closure, instead of turning at Eaton Saddle and climbing up and over the shoulder of Mt. Disappointment, the first leg of the race followed (paved) Mt. Wilson Rd. all the way down to Red Box. According to the topo map, this reduces the total elevation gain by about 700′ — from about 5800′ to 5100′. Comparing GPS traces from last year and this year, it looks like the 2009 course is about 0.8 mile shorter — 5.5 miles vs. 4.7 miles. How much would the change in course effect times? And, how do you compare a 2008 time to 2009 time? And, what time on this course would be (more or less) equivalent to my goal of finishing in under 7 hours on the standard course? In my case, I’ve run the 50K four times before, so I know my average time down to Red Box is about 60 minutes. This year the split was 20 minutes faster. I figure about 16-17 minutes of that is due to the difference in courses, This is close to what the 8:1 Naismith’s Rule would predict. Assuming an 8.5 min/mile pace on the flat, the 700′ climb should add about 9 minutes, and the additional 0.8 mile should add about 7 minutes. So, subtracting 16 minutes from 7:00 hours my new time goal was 6:44. I might have run this leg a little too fast — I did feel some tightness in my quads at Red Box — but the long, fast downhill on pavement was an offer I couldn’t refuse. Behind me, I heard the surprisingly loud, “thunk!”of the toe of a running shoe catching on a rock, and then a grunt. Time expanded as I turned, and I watched in slow motion as a runner gracefully flew through the air, tucked, rolled, and in a backlit cloud of swirling dust, slid 50 feet down the steep, pine needle covered slope. Maybe because it’s downhill and in shade, I’ve seen a number of runners trip on this section of the course, but this fall took the Gold. The good news was the runner was OK. Although this was probably the fastest I’ve done this leg, it didn’t feel that way. I wasn’t holding back, but wasn’t pushing the pace either. 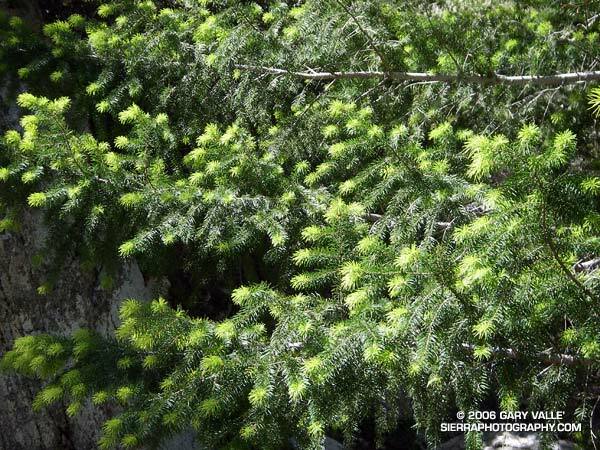 OK, OK, I know better than to push the climb up the Josephine Fire Road too hard. To this point, I was hanging with a some runners that would eventually finish the 50K in the 6:00-6:15 range. Didn’t know that at the time, and in my enthusiasm passed them on the hill. Bad move. I coughed and sputtered after accidentally inhaling some of the Heed I was trying to drink. Jimmy Dean Freeman was cracking me up telling stories about some recent ultras. There are two legs of the course where training pays big dividends, and this is one of them. Jimmy Dean and his wife, Kate, were running free and easy. It didn’t take long and they started to pull away. Runners trained for longer distances seem to have a much better time of it on this part of the course. Even on a coolish day like today, the climb to Lawlor Saddle was on the warm side, and I found myself walking stretches that with just a little more “umph” I could have been running. For a while, I ran with a runner, who — if I heard correctly — warmed up for the Mt. Disappointment 50 miler by doing an Ironman Tri the previous weekend! Although my time from Clear Creek to Red Box was 10 minutes faster than last year, I think my overall time would have been faster if I had taken it easier on the Josephine climb. I don’t know what makes this leg so difficult, but every year it’s a tough one for me. Fresh, it would be a run in the park. After 21 miles of this race, and 4000′ of elevation loss, “it ain’t so easy anymore.” Some years there is water in the creeks that cross road, and a cap-full of water over the head helps. Not this year. Lynn Longan, another one of the runners I’d passed on the climb up to the Josephine aid station, caught up to me a little before the West Fork aid station. In addition to two 50 milers earlier in the year, she had run the TRT 50 mile three weeks ago, and the Miwok 100K before that. I was about to learn what running longer can do for you. I left the aid station a little ahead of Lynn, but it wasn’t long and I heard footsteps coming up behind me. Looking strong, she cruised past and was soon out of sight. I was worked. I could run some on the flat, but uphill running was not going to happen. Then there the water issue. Two bottles is never enough for me on the Kenyon DeVore climb. I knew that going in, and should have taken the time at the West Fork aid station to drink more water and defizzed cola. The plan had been to refill at a creek crossing a couple of miles up the trail. 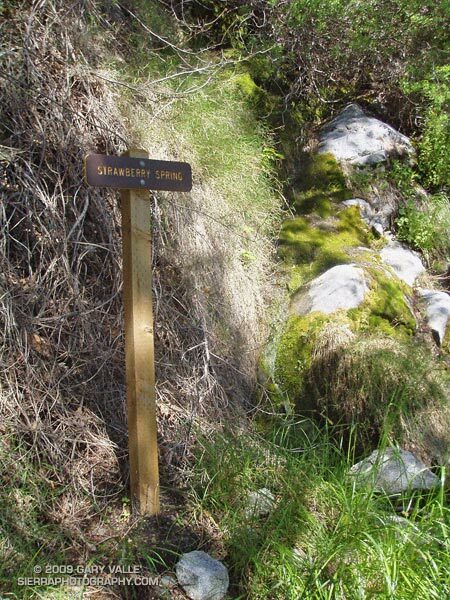 But there was a potential problem — this year almost all of the small creeks had been dry! The creek wasn’t dry, but it wasn’t all that wet either. The flow was marginal and there was a lot of debris in water. But I had refilled here several times before, so maybe it would be OK. I’d already gone through my first bottle, and had started on the second, and there was still 3.5 miles and 1700 feet of climb to go. I decided I would only drink it if I had to. Without inspecting the source too carefully, I filled the bottle and hurried back to the trail. While I had been busy getting water, two runners had run past. The Kenyon DeVore trail is cruel. Glimpses of the antennas on Mt. Wilson look tantalizingly close, but the trail climbs, turns, and then climbs some more. I drank all of the creek water and was happy to have it. Even with the extra water, my legs were getting crampy, and I just hoped I could get to the finish without a full-on bout of adductor and hamstring cramps. Time in… 6 hours 34 minutes — with an average pace more than a minute per mile faster than last year, and ahead of my adjusted time goal of 6:44. Here’s an elevation profile, and a Google Earth browser view of a GPS trace of the course, with mile splits generated by SportTracks. Click on the red icon for the split time. The 2009 course is the yellow trace, and the 2005-2008 course is the red trace. As always the event was superbly conducted by race director Gary Hilliard, the Mt. Disappointment 50/50 Staff, and a extraordinary group of friends and volunteers. Thank you!